Those that have taken the National Registry Certification Test report that the TeamCME Practice Test was “the reason” they passed. Our practice test is a teaching tool for those preparing to take the National Registry Certification Test. It is a collection of 200+ of the hardest, most difficult questions we at TeamCME could come up with. Medical Examiners report they get only 50% correct the first time thru. Why the hardest possible questions? Because if you can answer the hardest questions, you can answer the questions on the “real” certification test. As you answer each question, a comment appears that explains why your answer is right or wrong. This reinforces a deeper knowledge of the medical standards and guidelines. Also included are suggestions for “correct thinking”, what to look for in test questions, what to do when you don’t know the answer, how to familiarize yourself with the computer system used to take the test, and test taking skills to employ. Take the test on your own schedule. A number of right questions answered in the current session appears on the page. Log in one or one hundred different times. Before logging out, write down the number of the last question you reviewed and start you next session from there or from any other question. Unlimited access for one month. 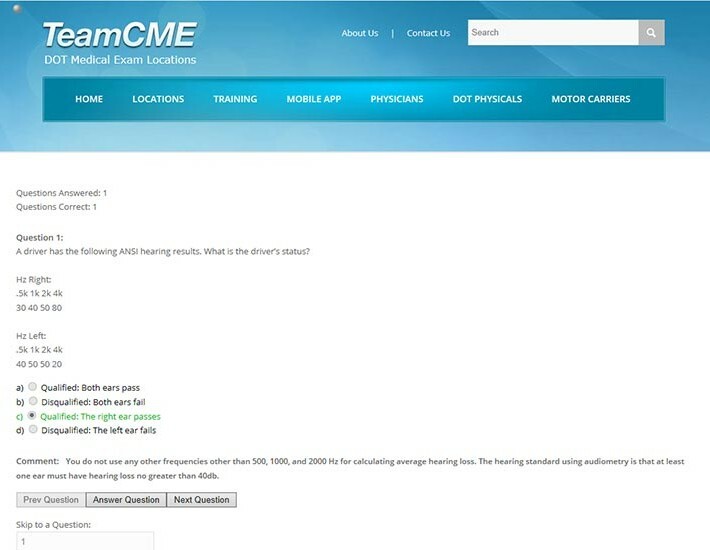 Become a TeamCME member and get free unlimited access to the practice test. Non-Member: $29.95 access for one month. If you have already purchased an access code you can either click the link provided to you in your email receipt or simply log into your account first. If you have an access key, you can enter it on the practice test page. If you are a member of TeamCME you can sign into your account first to get unlimited access.